As my alarm went off, I literally rolled out of bed, forcing myself awake way earlier than I wanted. Having went to bed only 3 hours before, due to a late night at work, I stumbled, hunchbacked with eyes half open, into the bathroom. I had promised my friend, Mike Smith, that I would meet him at his house, about 45 minutes away, for a 4ish hour ride to Panther Creek State Park in Morristown, Tennessee. My original plan was to beg Mike to let me sleep on the trip up in an effort to get caught up on sleep. With a pre-ride of the course planned for later that day and a subsequent race the next morning, I needed all the rest I could get. Armed with coffee and lots of great conversation, the trip was over before I knew it and didn’t feel like I needed the sleep. 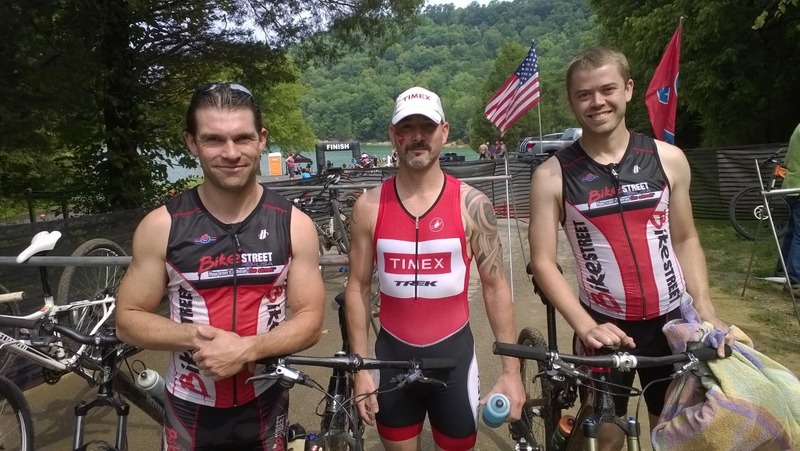 We pre-rode the course, went for a quick run and swim. In the process, we came across 4 wild turkeys along with a half-dozen or so baby turkeys. They didn’t seem the least bit worried about us and took their time getting off the trail. It was surreal. That evening, we met up with good friends, Owen, Sunny, Mia, John, Jheremy, Mark and Rachael to name but a few. Race morning started off with the usual pre-race routines. We got to transition early and managed to get some good spots and all setup with time to spare. We all piled in the water and waited for the pre-race briefing to start the race. I was a bit nervous with racing back-to-back after last week’s XTERRA Whitewater race as I wasn’t sure if my body had fully recovered. With a countdown and a blow of the horn, the race was off. 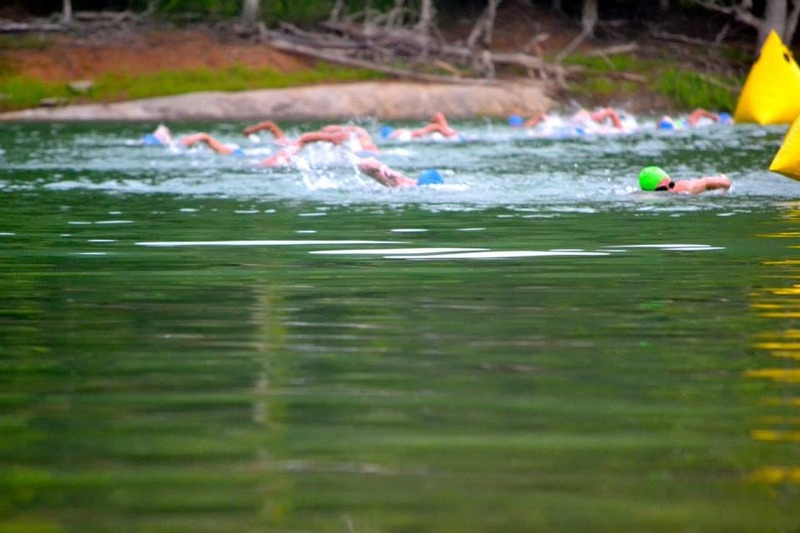 I managed to sprint out with the lead pack of swimmers and ahead of the chaos. It was one of the cleanest starts I’ve had to date. 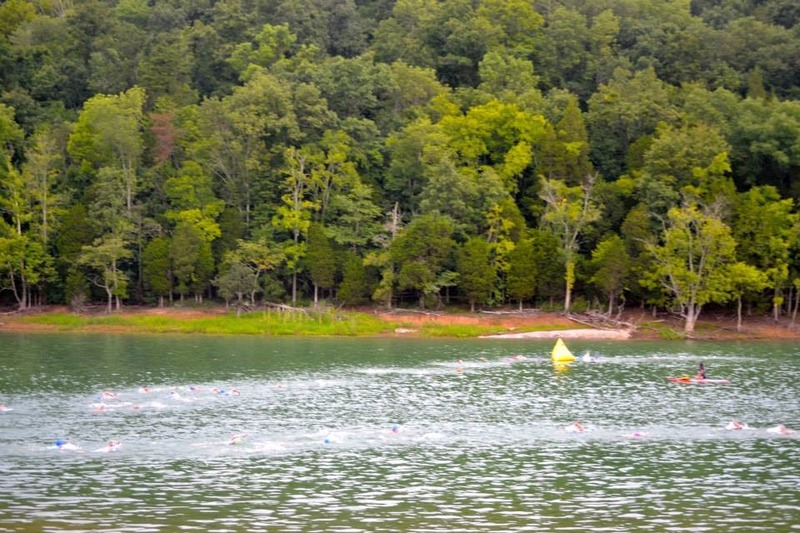 The swim was setup in a triangular course of 400 meters of which we had to do two laps. 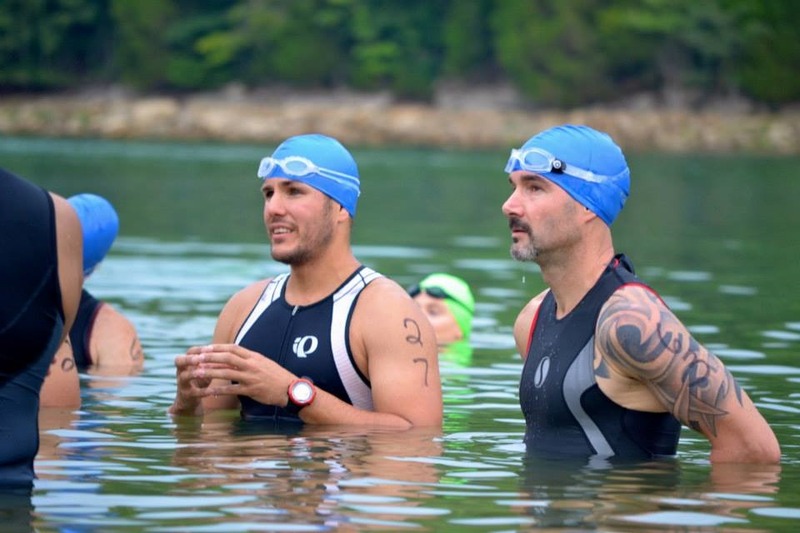 After the race, we all agreed that, even looking at some GPS watches, that the swim was a little long. 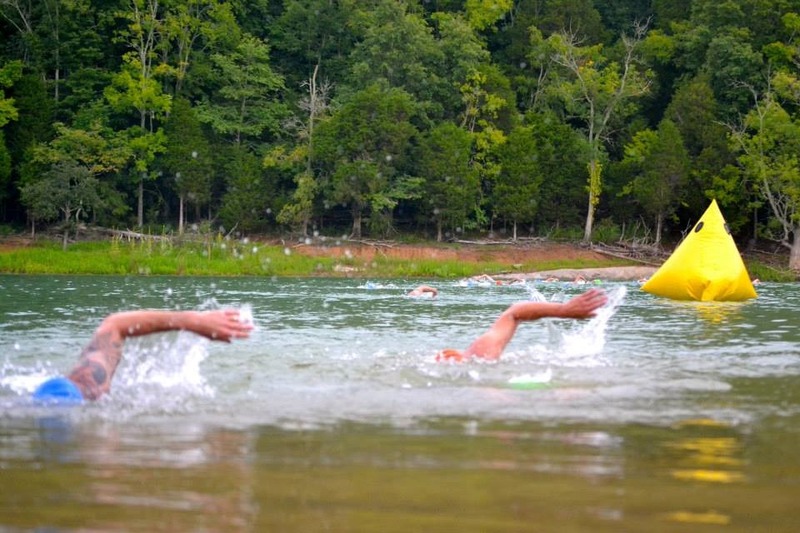 By the time we hit the third buoy to end my swim and head for the shore, I had settled into 8th or 9th place. I tried my best to not “salute” my recovery stroke like Cheryl, our Masters coach teases me about, but as you can see by the picture below, I allowed the bad habit to show up. I finished up the swim in 8th place in 11:49. Running into transition, I completely goofed up on my T1. A while back, good friend Charlotte Mahan, gave me a gift of a red transition mat that I could lay on the ground to put my stuff on. I had used it for the last couple of races, but for this race, I decided to forego it’s use since the transition area was on pavement. Having the habit of looking for that mat, I ran straight to the rack with the red mat and familiar bike shoes. I stripped off my Synergy Syn-Skin and dropped my goggles and cap. As I started to put on the shoes, I realized I was standing at Mike’s rack. Realizing my mistake before I put the shoes on, I hopped over one rack and completed my transition. My transition time could have easily been under a minute, but instead, it ended up being 1:03. 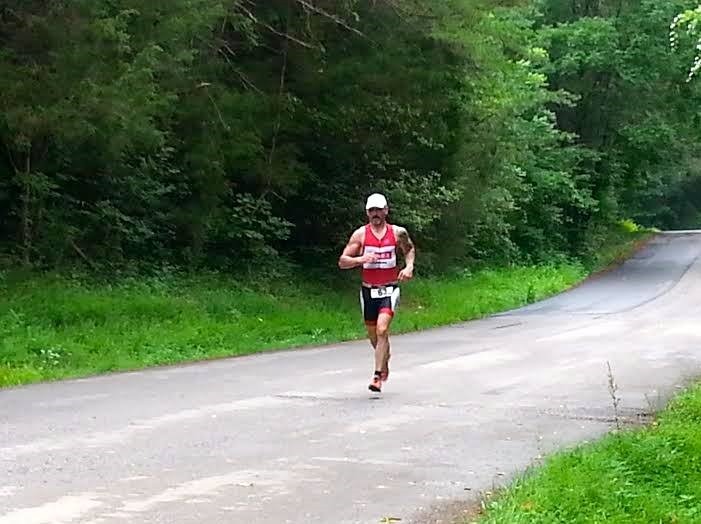 I dove into the trail from what I thought was around 5th place or so, having passed a few people in transition. Within the first quarter of a mile I caught up to the first rider and at about the half-mile point the next rider. As I finished off the first mile or so, just before crossing the paved road, one of my water bottles ejected like a rocket off into the woods. I’ve dropped bottles plenty of times and had heard of them “ejecting” but in all my years, I had never witnessed the way this thing took off. For a split second, I thought about leaving it. In that same split second, I realized the importance of the fluid intake and I came to a skidding halt. I laid my bike down at trailside and bounced off the trail like a gazelle trying my best to dodge the poison ivy as I went. Twenty or so feet off of the trail, I retrieved the getaway bottle and bounced back to my bike. I’m not sure how much time it wasted, but in a race where every second counts, it was too much. It took me a while to catch up to the two leaders, who were riding in tandem. When I passed the second place racer, he confirmed the person in front of him was the leader and I thanked him while picking up the pace a little. Once in the lead, I tried to keep it fast and smooth. The roots were slick from the morning’s rain and they all seemed to be off-camber or sideways in the trail. Every time I hit one, it would kick my bike to one side or the other, but the Schwalbe tires kept the grip on. I was surprised yet again by the performance of the Thunderburt in wet conditions. Roots and rocks weren’t the only obstacles. During the bike leg of the race, I managed to almost get run over by a deer crossing the trail. This not only happened once, but TWICE. The weirdest part was, it was on opposite sides of the course and about a half-hour apart. I guess they were coordinating attacks and trying to do so when my guard was down. Despite the natural obstacles, both plant and animal, I kept it upright (luckily) and finished the bike at 1:09:12, the fastest split of the day. T2 was a much smoother transition. Having made the silly mistake in T1, I really focused on making sure I went to the right rack in T2 while also trying to be as quick as possible. 21 seconds. 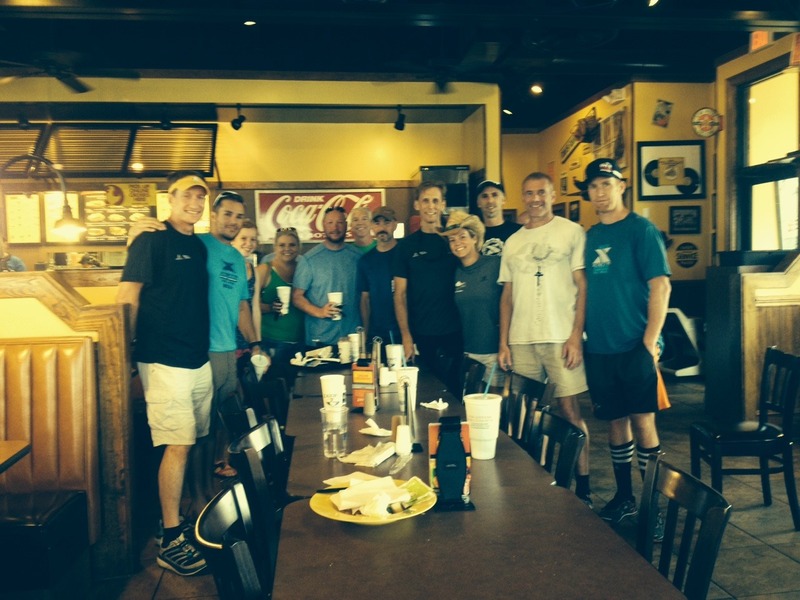 Afterwards a bunch of the XTERRA family piled into a fast food joint for good (bad) food and some great stories with great friends. Products used: GU Roctane and GU Brew, Schwalbe Rocket Ron Tire, Schwalbe Thunderburt Tire, Cobb DRT SHC Saddle, Synergy Syn-Skin, ESI Grips, Crank Brothers Candy 11 Pedals, First Endurance Multi-V.